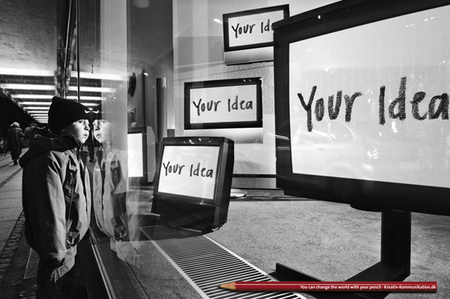 This poster has just won the Grand Prix in the outdoor category at the Cannes Lions festival. 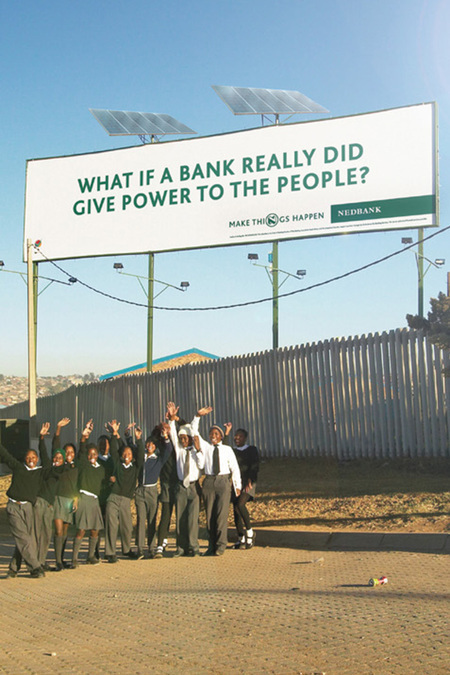 "The World's First Solar Powered Billboard, from a bank committed to making a real difference, was designed to harness and convert the heat of the African sun into a much-needed necessity, electricity. It currently powers the kitchens of a township primary school, feeding 1100 kids and in time will completely generate the school required power needs. The idea is currently being rolled out across the country. Apart from the obvious benefit to communities, traditional electricity use is the major cause of global warming, so imagine what a difference it could make if every marketer adopted this approach to outdoor? The initiative will save the school R2300 a month in electricity charges. The bill board has 10 solar panels with each panel generating 135 watts of power. The power generated from the panels will be enough to boil 18.1 litres in domestic kettles continuously at any one time, which goes a long way towards the schools feeding scheme. "You can't teach a hungry child" enabling more students to receive breakfast and lunch. The billboards batteries store enough energy to make the billboard completely self-sufficient generating sufficient electricity to light up at night." Is it just me or does this smack a little of greenwashing? I'm left wondering why they attached a large poster to the bottom of the solar panels? And the text just annoys me. Are they really claiming that this 'idea' that they are rolling out across the country is theirs, as if they invented solar panels? I might just be being pedantic but wouldn't it have been better/cleverer idea if they used a giant panel as a poster instead. At least the poster would have been integrated somehow instead of just hanging underneath looking a little bolted on. Don't get me wrong. It's brave and it's undoubtedly doing some good, I'm just not sure. It is really a very difficult area to be in. It raises so many questions. Maybe they would have been better off just providing the funding for the panels? What else are they doing to help? What is their CSR policy when it comes to investing ethically? Having thought about my earlier post a little more, I actually think there's a pretty good business idea in it. Reading about Kidzania reminded me a little of the stories I heard about the way they financed that film 'The Terminal'. Apparently they had brands queing up to buy a space in the terminal/script. Like the film, a green theme park would be a great way for organiations to demonstrate an interest in green/sustainable ideas. "It's a hit among sponsors, too, who get the opportunity to introduce their brands—and their trades—to the younger set through a unique interactive experience." A big part of doing the 'green' version would of course be getting the right kind of companies in involved. I'm thinking maybe someone like LEGO might be interested in something like this? The down-side is of course it would require a huge investment up front. Anyone got a rich uncle with a taste for green initiatives? 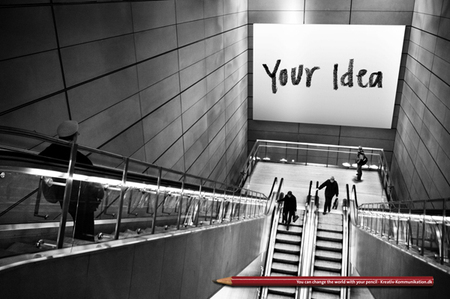 Inspiration: One way to pursue win/win in personal or organizational needs. Last year I met the author of “Nonviolent communication” (Girafsprog), Dr. Marshall Rosenberg, in Copenhagen. When you experience the guy live and interactive, he is extremely inspiring. Have a look at one of his interviews if you’re interested. Warning: 28 minutes, and this is only part I! We've been busy creating a new campaign for 'Den Grafiske Højskole' here in Copenhagen. The campaign which aims to create awareness and ultimately generate applications for the new education 'Kreativ Komminikation' (creative communication) is based on the insight that working in the communication industry, you are in a unique and empowering position of influence. 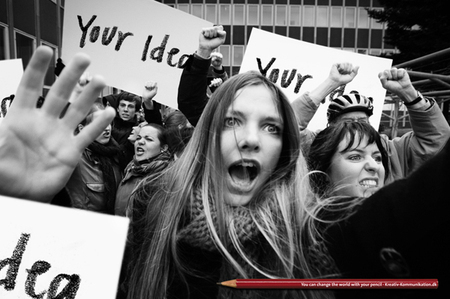 All the executions carry the line 'you can change the world with your pencil'. The images were shot by award winning Danish photo-journalist Erik Refner. You can expand the images by clicking on them.